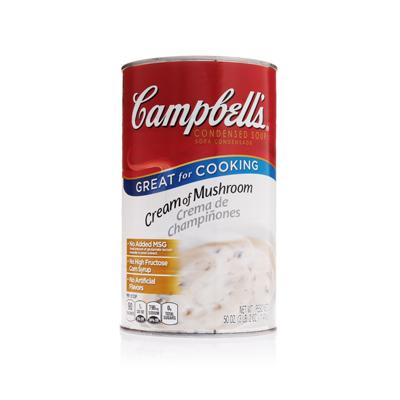 Crispy potato topped with a medley of peppers and onions, and flavored with Campbells® Cream of Mushroom Soup. Perfect for a holiday brunch! 1. In large skillet heat oil over medium-high heat; add onions and sauté 4 minutes. 2. Add peppers and garlic and sauté 1 minute. 3. Mix in mushrooms and sauté 5 minutes or until mushrooms dont give off any more liquid. 4. Remove from heat and cool. Reserve. 5. In pot heat Mushroom Soup and milk over medium-high heat until hot and smooth; remove from heat and cool. CCP: Cover and refrigerate to 40° F. or below for later use. 6. When cooled, whisk in eggs until blended. Reserve. 7. For each full steam table pan: Spray pan with non-stick spray. Pat 3 pounds of hash-browns into bottom of each pan. Bake in 400°F. convection oven for 30 minutes or until brown and crisp. Remove from heat and cool. 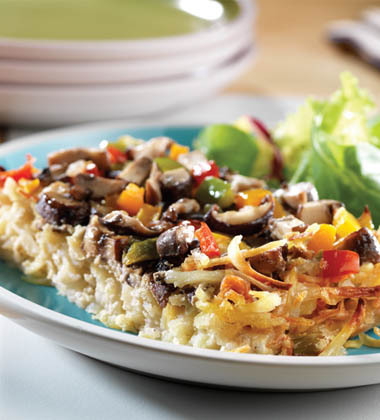 -Spread 4 cups of mushroom-pepper mixture evenly over top of crisp hash browns in pan. -Pour 9 cups of mushroom custard evenly over top of mushroom mixture. 9. Place pan into 325°F. Convection oven and bake 40-50 minutes or until custard is firm and slightly browned. Let sit 15 minutes before serving. CCP: Hold at 140° F. or higher for service. 10. To Serve: Cut each full steam table pan into 12 pieces (about 2" x 3-3/4"). One serving = 1 piece. Suggested recipe variation: instead of just one kind of mushroom, used a mixed variety. Suggested menu accompaniment: offer with a crisp green salad. Recipe sized for 12 portions will make one (1) half-sized pan. Recipe sized for 24 portions will make one (1) full-sized pan.